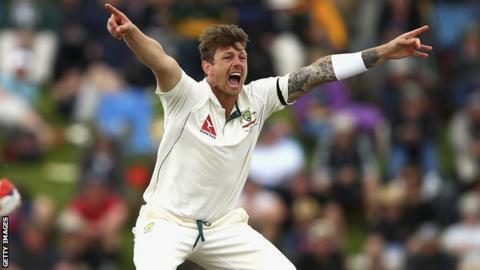 Nottinghamshire have signed Australia pace bowler James Pattinson to replace injured compatriot Peter Siddle. Pattinson, the brother of former Notts bowler Darren, will be available for the County Championship and 50-over One-Day Cup until the end of June. The 26-year-old made the last of his 17 Test appearances for Australia against New Zealand in February 2016. Siddle, 32, signed for Notts on a two-year deal ahead of last season, but never played because of a back injury. "As soon as James became available as a replacement, we knew he was a great option," head coach Peter Moores said. "He's got real pace - and he's very aggressive, which is the way we want to play our cricket." Pattinson has struggled with a string of injuries in recent seasons, and asked not to be considered for Australia's current tour of India in order to regain full fitness playing for Victoria in the Sheffield Shield.